Gus Edwards and Lamar Jackson were the lead players in another ferocious display from the Ravens’ ground game. The scheme and the offensive line gave them a solid platform, but along with Kenneth Dixon, the Ravens’ ball carriers were at their elusive best and forced more than 10 missed tackles on the ground. The Ravens rotated between James Hurst and Bradley Bozeman at left guard, and while they got quality contributions from both, the rookie from Alabama outperformed his veteran colleague on this occasion. Bozeman gave up nothing in pass protection and created consistent movement and creases both inline and on the move in his most extensive action since Week 7. Marlon Humphrey gave up a single penalty before the Bucs’ touchdown (his fourth in the last three weeks), but aside from that, he turned in one of his better games of the season, rebounding nicely from a subpar display against the Chiefs last week. A pass breakup and an interception were the highlights as he got his hands on as many passes as catches he allowed. Brent Urban has had a solid season against the run, but he struggled to hold up at the point of attack against the Bucs’ double teams. Particularly against the combo of Donovan Smith and Ali Marpet on the left side of the Bucs’ offensive line, he gave up consistent movement and struggled to keep his linebackers clean to make plays against the run. This was a typical Jameis Winston performance; big plays both for his team (his deep shot on a scramble in the first half) and for the opposition (trying to throw a pick on the Bucs’ field goal drive in the third quarter). Today’s performance leaves no clearer view of whether or not he can tame his inconsistencies. Ryan Jensen returned to Baltimore for the first time since he signed with the Bucs as a free agent, and his former teammates proved a handful for him. This first season in Tampa Bay has been a struggle for Jensen and this week was no different, as he struggled against the power and short area quickness of Brandon Williams and Michael Pierce against both the run and the pass. The Ravens’ rushing total hides a strong showing from the Bucs’ first-round pick. Vita Vea was more than just an immovable lump for the Ravens’ interior offensive linemen, he was disruptive and made his share of plays against run and pass. Lavonte David was another bright spot for the Bucs. While their edge defenders were neutered and outflanked by the running threat of Lamar Jackson, David did his best to close down space and turn runs back inside, but in the continued absence of Kwon Alexander, there was a lack of quality support for David to try and contain the Ravens’ ground attack. Baltimore: With their new-found rushing attack, the Ravens can shorten any game that they have the upper hand in, and that’s just what they did, taking away any chance of a comeback by Jameis Winston. 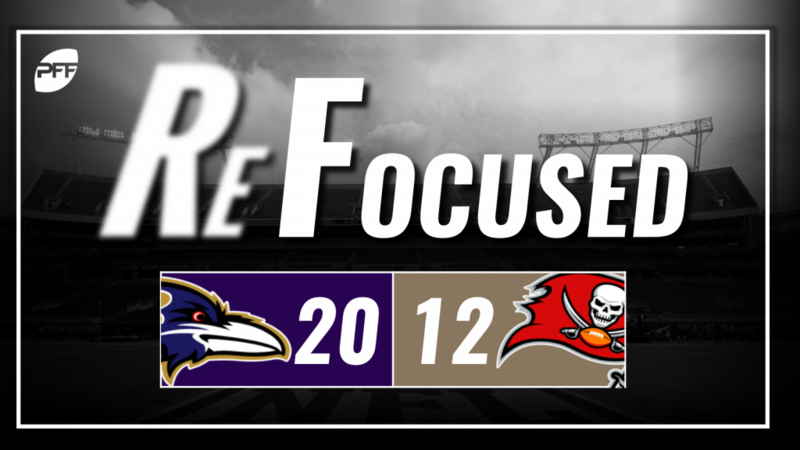 Tampa Bay: They did their best, but the Buccanneers were ultimately unable to get the better of a thriving Ravens ground game.